While sorting through and finally hanging our artwork this past week, I found a stash of Steve Keene paintings a friend sent my way several years ago. Having run out of wall space, I am sure Largehearted Boy readers can appreciate the three paintings and can give them a good home. 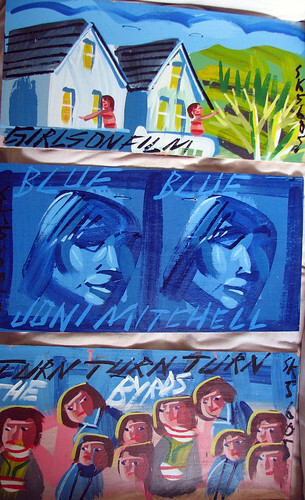 Steve Keene draws vibrant paintings of album covers and pop culture icons, and these paintings capture the essence of the cover artwork of Joni Mitchell's Blue, and The Byrds' Turn, Turn, Turn, as well as a third painting titled "Girls on Film." At this point, our destination is up in the air... We could stay in Birmingham, or we could end up anywhere across the country. To enter the contest, leave a comment in this post recommending a city where my wife and I should move, and one reason defending your choice (feel free to duplicate a previously named city). The winner will be chosen randomly at midnight CT Friday evening (September 25th).